The Province of Ulster, or in Irish Cúige Uladh, encompasses the North-East of Ireland. The counties of Antrim, Armagh, Cavan, Derry, Donegal, Down, Fermanagh, Monaghan and Tyrone make up this ancient province. Cavan, Donegal, and Monaghan are part of the Republic of Ireland, the rest are the six counties that form Northern Ireland. Major towns are Bangor, Belfast, Craigavon, Derry, and Lisburn. The rivers Bann, Erne, Foyle, and Lagan flow through Ulster. The highest point within the 8,546 square miles of the province is Slieve Donard (2,790 feet). The population is steadily growing and currently estimated at over two million. Around 80% of these live in Northern Ireland. The name "Ulster" derives from the Irish tribe of the Ulaidh and the Norse word Stadir ("homestead"), the name being in use both for the province (correct) and to describe Northern Ireland (incorrect). Ulster was one of the earliest centers of culture in Ireland, this is reflected in the number of monuments and artifacts found here. With plantations of Protestant settlers starting around the 16th century Ulster itself became the center of sectarian tension and violence. Today Ulster is recovering on both sides of the border, with the six Northern Irish counties still polarised into two distinct fractions. Long regarded as one of the most dangerous places in Ireland and all Europe, Ulster has now been changed nearly beyond recognition due to the peace process. Ulster is safe and should not be missed. Museums, castles, famous cities and natural attractions are waiting for you. 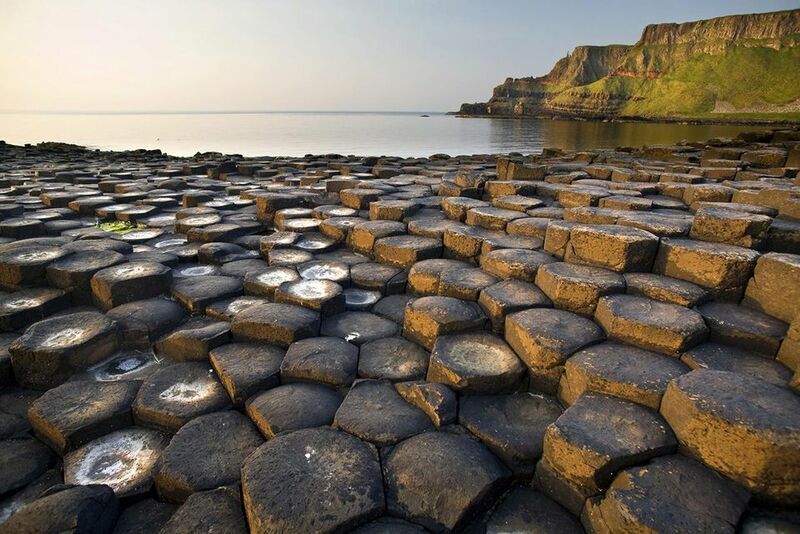 Northern Ireland’s top sight and accessible by car and shuttle-bus (if the fairly steep final mile seems too daunting) - the famous Giant’s Causeway. Strangely regular basalt columns point the way towards Scotland, seen on the horizon on good days. Travellers with some time on their hands are advised to take in the nearby Old Bushmills Distillery, connected by steam train. Despite the similar claims of the Cliffs of Moher, the cliffs at Slieve League near Carrick (County Donegal) are officially the highest in Europe. And they are fairly natural still. A small, winding road leads up to a gate (remember to close it) and two car parks. Those suffering from vertigo should definitely leave the car at the first one. And walk from there. Long dominating the headlines with sectarian violence, Derry City (the official name) or Londonderry (still the legal name according to the charter) now attracts more shoppers and sightseers than reporters. The famed city walls that withstood the Siege of Derry (1658) can be walked and allow for views into Catholic and Protestant quarters, both with their own murals and flags displaying allegiances. Several valleys stretch inland from the Antrim coastline, nestling between ridges of wooded hills. This is an ideal country for long walks. Some of the best amenities can be found at the Glenariff Forest Park. The largest city in Ulster, Belfast is still divided along sectarian lines but life is looking as normal as can be to the visitor. At least in the city center. Look at the quaint Opera House and the splendid City Hall, have a pint in the historic Crown Liquor Saloon or the Europa Hotel ("The most bombed hotel in Europe! "), enjoy the shopping or a cruise on the Lagan. Or simply enjoy the animals of Belfast Zoo. The "Village of Cultra" is a faithful recreation of Ulster life in the 1900s, complete with local industries, farmsteads, and no less than three churches. Buildings are either originals relocated or reconstructed. Just across the road is the Transport section of the museum, with massive steam locomotives and a very good Titanic exhibition. You might hear bluegrass music drifting through the air. Or occasionally see Union troops passing by, followed by some Confederates. Special events are numerous at this huge park. But the usual emphasis of the Ulster-American Folk Park is on the emigration from Ulster to the USA. And visitors can re-live this experience, making their way from humble cottages to a busy city street, boarding a sailing vessel and actually arriving in the "new world". This is not a lake but a sea inlet - which the necessary use of the Portaferry to Strangford ferry will make obvious. Hundreds of islands dot the lough, on one you will find the long lost Nendrum monastery with its round tower. Visit the Saint Patrick Centre and cathedral in Downpatrick on the trail of Patrick, Ireland’s patron saint. Alternatively observe wildfowl at Castle Espie, visit the splendid Mount Stewart House and Gardens or climb up to Scrabo Tower (near Newtownards) to have the best view. Florencecourt is one of the splendid "great houses" to be found in Ireland. Though burnt out in the 1950s, the house has been lovingly restored and is now in the care of the National Trust. But the house itself is only part of the attraction. The huge grounds are a feast for the eyes and invite to take long (but never exhausting) walks. Several once necessary workshops like the sawmill or the forge are to be found. And do not miss the granddaddy of all Irish yews in the gardens! Situated on the northern shore of Belfast Lough and landing place of William of Orange in 1690, this small town has a pleasant center with old and new architecture combined to good effect. Pride of place, however, goes to Carrickfergus Castle. Standing on a basalt ledge near the shore, this medieval fortress is still intact and a visit can even include a medieval banquet. You might also want to visit the Andrew Jackson Centre nearby, a recreation of the ancestral home of the 7th president of the USA.